The Stick-N-Find BluTracker battery will last for over 2 months between charges, and it has a full GPS engine and motion detector with no service fees. There are a lot of good use cases for a small GPS locator like this. Easily attach it to pets, personal property like bikes or even add an extra layer of security for your children. 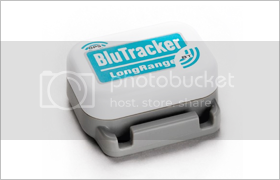 The US version of the BluTracker uses a custom modified RF amplifier designed for very long range which allows it to track things up to approximately 2,500 ft.
You will be able to pinpoint the BluTracker easily on Google Maps – you will show up as a blue dot and BluTracker will be red. You will also be able to draw a circle to create a sort of virtual fence. Any time the BluTracker moves outside this area, your phone will alert you. Because GPS does not work indoors, the app has a radar feature which can only be used to approximate the distance of the BluTracker to your phone, but not direction. When you start walking in a specific direction you will be able to tell if you are getting closer or farther away. BluTracker will encrypt the signal, so only the phone that was paired with BluTracker will be able to decode the signal. It is also water resistant and the app comes in iOS and Android versions. Head over to the site to pre-order one now.